Our rooms are carefully and beautifully arranged to optimize and encourage exploration and learning. The classrooms themselves serve as the third teacher. Soft colors and gentle lighting create a soothing atmosphere. 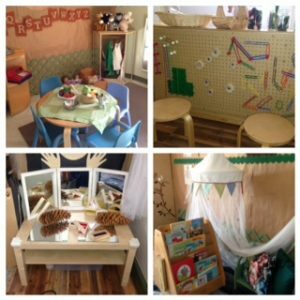 Rooms are divided into learning areas: a space for class meetings and story time, a writing area, a building area for blocks and other manipulatives, a classroom art studio, and a dramatic play area. 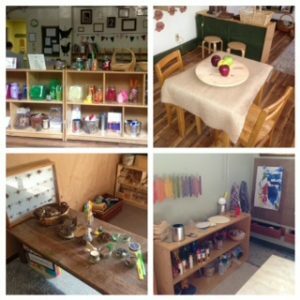 Natural and interesting materials encourage open-ended and process oriented activities, which develop problem solving, creativity and independence. 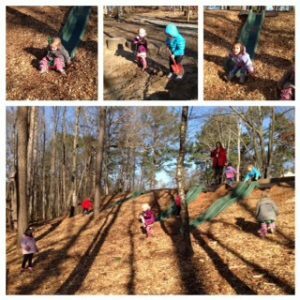 Our school has a traditional playground as well as a natural playground. Our Natural Playground is designed to encourage time outdoors. here children learn and build gross motor muscles. 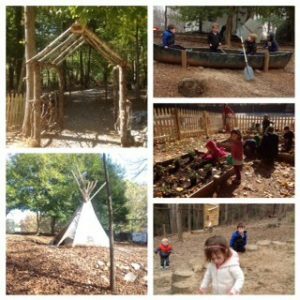 This outdoor classroom includes raised beds for our gardening program, a sand area and mud kitchen, a full-sized tipi, canoe, easels and chalkboards, a water-wall, slides and an altar for outdoor chapel. 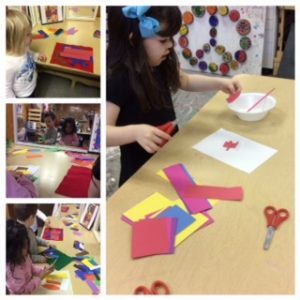 Our art studio is a dedicated space for small group art activities. The studio provides a place for children to master a variety of artistic techniques, including painting, drawing, and working in clay – all symbolic languages. 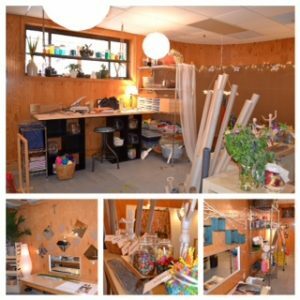 More than a place for arts and crafts, the Studio is a place for thinking and making connections – a place to learn that thinking can be expressed through materials. In the Studio, children experience the freedom to create process-based works of art and beautiful group projects that adorn our school. 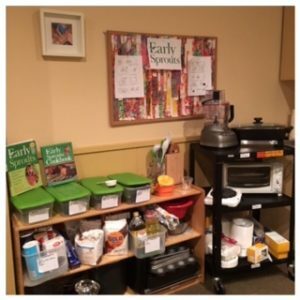 Teachers and staff are trained in the Early Sprouts Cooking program for early childhood programs. 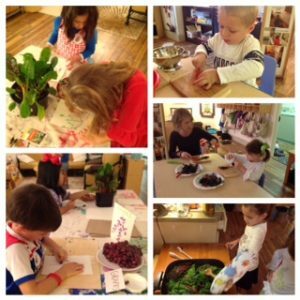 Children participate in our Fruit and Vegetable of the Month program, monthly hands-on exploration of healthy fruits and vegetables and cooking activities are the highlight of classroom experiences. 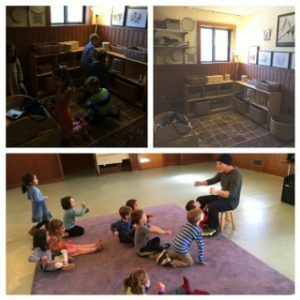 Children attend Music and Movement Class in our Music Room located in Kiernan Hall. Classes focus on song, instruments, rhythm, beat, muscle growth and just plain active fun with music. We also have a ‘Music Lab’ where children experience a more intimate study of sound and musical instruments and stories. The Atrium is located in the Youth Lounge in the Preschool building. The Atrium is a sacred space that the children experience in small groups with our catechist or their classroom teacher. This is a place for prayer, in which work and study spontaneously become meditation and spiritual contemplation. A place where “the only Teacher is Christ.” Both the children and adults place themselves with listening minds and awareness. 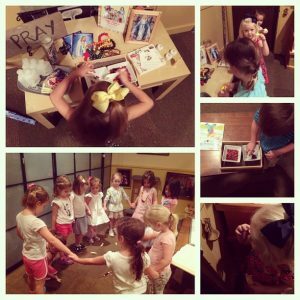 The children learn about various saints, prayers, bible stories and parts of the church, altar care and practical living skills in a hands-on and developmentally appropriate setting. 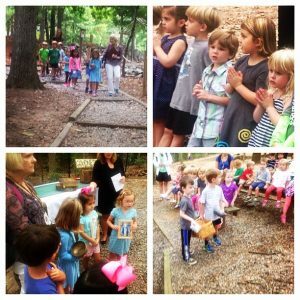 Culmination of small group Atrium sessions are celebrated during our monthly chapel in the Pray and Play Meadow.